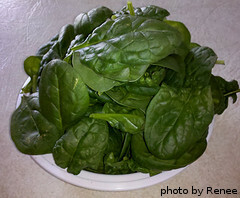 Want To Learn About Growing Spinach? When it comes to growing spinach, weather and seasonal patterns will have a big impact on the success of your crop. Spinach is a cool season crop that grows best when days are shorter, with 14 hours or less of daylight. Spinach also doesn't do well in hot weather. The plants tend to bolt quickly when the days get longer and the daytime temperatures heat up. 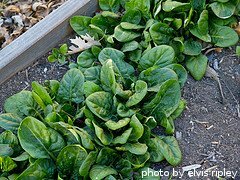 In general, spinach can be grown in both the spring and fall. In warmer climates, fall is usually the preferred season, while in northern areas, spinach is usually best grown in the spring. After the plants sprout, spinach grows best when daytime high temperatures are in the 50-70 degree range. It is often planted 4-5 weeks before the last expected frost date in the spring, and 8 weeks before the first expected frost date in the fall. The seeds germinate when soil temperatures are in the 40-75 degree range. Mature plants will tolerate temperatures that dip slightly below freezing at night. Since it is a cool-season crop, spinach is a good choice for early spring gardens, and it's usually one of the first edible crops to be harvested in the spring. Most spinach varieties are ready for harvest 6-8 weeks after planting. The leaves can be harvested at any size, with the smaller leaves being more tender in general. A carefully harvested spinach plant will keep producing leaves as long as the weather cooperates and temperatures remain in a reasonable range. Spinach is also one of the last crops that can be harvested in the fall. Spinach is a great choice for container gardens. 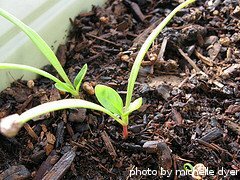 Spinach planted in a few pots in a sunny spot on a porch, deck or patio will provide plenty of fresh leaves for the average family. The average spinach plant has a spread of around 6-8 inches and reaches 8-10 inches tall. There are lots of different ways to cook with spinach. It can be sauteed, steamed, boiled, creamed or eaten raw. In addition, spinach can be preserved by canning or freezing. There are several varieties of spinach that are commonly available from seed companies and garden shops.